There are certain risks that are specific to international stocks, but when combined with U.S. stocks there’s a good chance that they will decrease the amount of investment risk you face. Vanguard published a paper in 2012 that looked at several aspects of international investing, and one of the things they found was that a global portfolio was less volatile than holding either U.S. stocks or international stocks alone. It’s a good practice that leads to better risk-adjusted investment returns. But for the most part it leads to slightly lower absolute returns, simply because it means you’re regularly selling the investments that are performing best in exchange for the investments that are performing worse. However, when you have two investments that provide similar returns but rise and fall at different times, rebalancing between them can actually produce a higher return with less risk than either of the investments on their own (see here for the math). 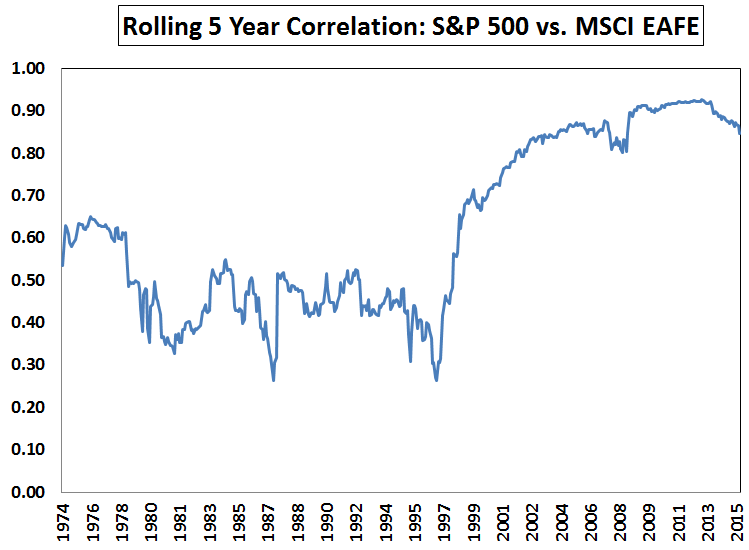 With that said, the correlation between these two investments has increased recently, and that dampens this effect. And since we can’t predict the future, there’s no guarantee that this will continue to be a benefit. Vanguard’s Total U.S. Stock Market Fund (VTSAX) costs 0.05% to own each year. Vanguard’s Total International Stock Market Fund (VTIAX) costs 0.12% to own each year. While the financial industry would have you believe that good investing is complicated, the truth is that the best investment plans are often the simplest. Vanguard’s research suggests that a minimum of 15% of your stocks should be invested internationally, with the maximum based on global market capitalization. According to the MSCI All World Index, 47% of the global market is outside the U.S., so that would set your cap.